​ Goldenhide Enterprises, Inc (GHE), formerly Chelsi Leathershop Co. (CLS) is a one stop shop that offers both leather material and manufacturing services. With our tannery, we are able to manufacture leather material in accordance to the design requirements of the customer, then from prototype or sample development to bulk production, we assist our clients in developing products that fit their standards. ​ Our ability to produce our own material is definitely a competitive advantage as we are able to meet different budget points, supply requirements for mass production, and extend our control down the supply chain. Combining this competency with modern machineries, the company engages in a constant endeavor to set the highest standards in quality, performance, reliability, and professionalism. • To provide sustainable livelihood for the people who work for and with the organization. 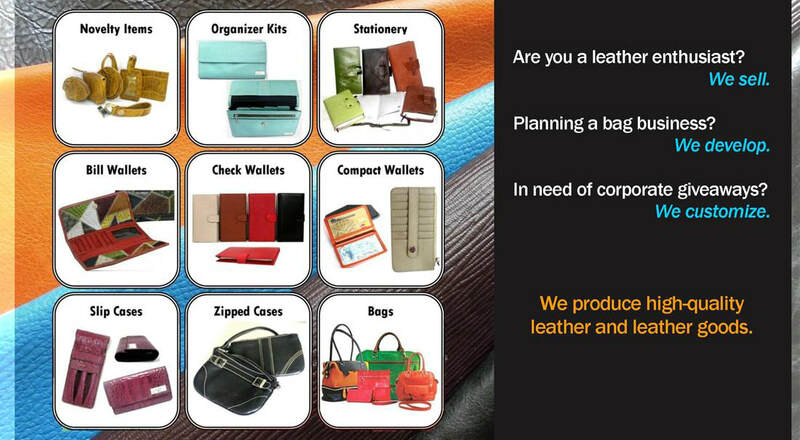 Goldenhide Entprises, Inc (GHE) aims to develop and reach our client's demand for quality leather goods. We produce an assortment of leather products, such as bags, novelties, accessories, and corporate giveaways. ​Mary Lazaro comes from a family who pioneered leather technology in Meycauayan, Bulacan. She was trained early on in the business of leather, working under her family's tannery all throughout her younger years. After getting married, she and her husband established a tannery of their own, Chelsi Leather & Services, Inc. The business started operations in 2002, producing different types of leather materials for local and export manufacturers of shoes, bags, and furniture. They saw the potential in the industry thus deciding to extend their services to the manufacture of finished leather products. In early 2007, Chelsi Leathershop Co. (CLS Co.) was born. At the onset, the company started with production of leather footwear for SM department stores, including children’s shoes, men’s, and casual styles for ladies. Early clients also included manufacturing for a Rustan’s a line of men’s casual bags made from leather and fabric. They also offered sewing and subcontractual services for the Philippine Army, producing military boots. On its second year, they opened a showroom located in Katipunan, QC to capture more business opportunities. The showroom displayed leather materials and leathergoods, which soon gained interest to leather enthusiasts who were able to see products unique from what is ordinarily available in the market. Not long after, the company started to cater to individuals who were looking for something customized or bespoked. Through the years, as the demand grew, so did the product line and their made-to-order service offering. Starting from only single-piece customized orders, the business shifted to larger volumes of production, catering to start-up entrepreneurs who were interested in opening a business of their own as well as traditional retailers and department stores. With good service, it was not soon after bigger businesses and brands also became clients. By 2009, the company's production capacity grew to a higher extent, venturing towards mass production of corporate giveaways for local private companies and white label business for export clients. At this time, CLS’s employees had mastered their skills into producing higher quantity requirements, while maintaining the quality craftsmanship of each leather piece. In 2017, the company has shifted to a corporation under the name Goldenhide Enterprises, Inc (GHE). Currently, the company's business has shifted to B2B catering to wholesale manufacturing of products for local and export consumption. GHE is supplying to local brands and various labels across the globe, with clients in Australia, Japan, Germany and US. It is also providing its service and products for those who are looking for company giveaways and wholesale transactions. Truly, it has come a long way from its humble beginning.